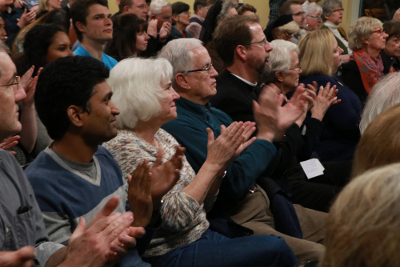 Gabriel Said Reynolds presents the annual Hesburgh Lecture, "Islam, the Catholic Church and the Future of the World," 3/21/18. In his talk, Professor Reynolds examines how Islam challenges Christian beliefs, reflects on how the Catholic Church should respond to these challenges, and offers a vision of how Muslims and Christians might work together to counter religious extremism. Professor Reynolds researches the Qur'ān and Muslim/Christian relations as Professor of Islamic Studies and Theology in the Department of Theology at Notre Dame. Co-sponsored by the Garaventa Center and the Notre Dame Club of Portland. Photos courtesy of Jeffrey Braccia/The Beacon.